Walter’s first involvement with soccer came at the age of 11, when he joined the Lighthouse Boys Club team in the Kensington section of Philadelphia. Within four years he had signed as an amateur with the Philadelphia Nationals of the professional American Soccer League. There he developed under coach Jimmy Mills, himself a Hall of Famer, and becoming a professional helped the Nationals win American Soccer League titles in 1950, 1951 and 1953. In 1949 and 1952 he was a member of the Nationals team that reached the U.S. Open Cup final, but lost on each occasion to a team from the Pittsburgh area. He won the ASL title again in 1955 and 1956 with Uhrik Truckers another Philadelphia team. Walter also played the 1953 summer season in Canada for Montreal Hakoah and once again his team reached the national final before losing to New Westminster Royals. In other years he played in the New York German-American League for S.C. Eintract and the German-Hungarians. On numerous occasions Walter played for the American Soccer League all-star team against some of the finest club teams in the world, including in 1948 the English team Liverpool and the national team of Israel. In 1950 against Besiktas of Turkey and Jonkopping of Sweden. In 1951 against A.I.K. Stockholm of Sweden. In 1953 against Rapid Vienna of Austria. In 1956 against the Israeli Olympic team, Everton of England and Rapid Vienna of Austria for the second time, and in 1957 against Hapoel of Tel Aviv. In 1948 he was selected for the U.S. Olympic squad at the Olympic Games in London and captained the team. However, soon after he signed as a professional and became ineligible to play for the Olympic team again. 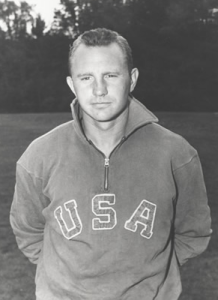 In 1949 Walter Bahr was a member of the U.S. World Cup team that qualified from a tournament in Mexico City for the 1950 World Cup of Soccer held in Brazil. There he played against Spain, England and Chile. Against England in Belo Horizonte he supplied the pass that led to Joe Gaetjens scoring the winning goal in one of the greatest sporting upsets of all time. In April of 1952 he was a member of the U.S. national team that played against Scotland at Glasgow’s famed Hampden Park before 107,765 fans. Altogether Walter Bahr played 19 times for the U.S. national team in full international competition at a time when the U.S. didn’t play anything like as many internationals as it does today. He is known, not only in the U.S., but around the world as one of the greatest and most respected soccer players ever to wear the shirt of the U.S. national team and has often served as an ambassador for his country.